Published by the American Geophysical Union as part of the Geophysical Monograph Series, Volume 100. Continental flood basalts, volcanic passive margins, and oceanic plateaus represent the largest known volcanic episodes on our planet, yet they are not easily explained by plate tectonics. Indeed, some are likely to record periods when the outward transfer of material and energy from the Earth's interior operated in a significantly different mode than at present. In recent years, interest in large-scale mafic magmatism has surged as high-precision geochronological, detailed geochemical, and increasingly sophisticated geophysical data have become available for many provinces. However, the sheer amount of recent material, often in the form of detailed collaborative research projects, can overwhelm newcomers to the field and experts alike as the literature continues to grow dramatically. 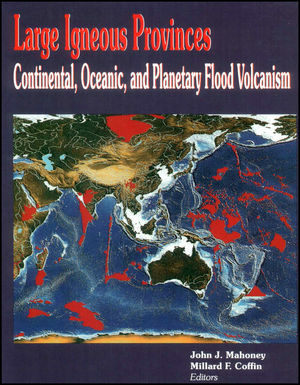 The need for an up-to-date review volume on a sizable subset of the major continental and oceanic flood basalt provinces, termed large igneous provinces, was recognized by the Commission on Large-Volume Basaltic Provinces (International Association of Volcanology and Chemistry of the Earth's Interior), and the co-editors were charged with organizing and implementing such a volume. We hope that this volume will be valuable to researchers and graduate students worldwide, particularly to petrologists, geochemists, geochronologists, geodynamicists, and plate-tectonics specialists; it may also interest planetologists, oceanographers, and atmospheric scientists. John J. Mahoney is the editor of Large Igneous Provinces: Continental, Oceanic, and Planetary Flood Volcanism, published by Wiley. Millard F. Coffin is the editor of Large Igneous Provinces: Continental, Oceanic, and Planetary Flood Volcanism, published by Wiley.